The Luna Sol Tarot is a new indie deck created by Mike Medaglia, co-founder of Liminal 11. 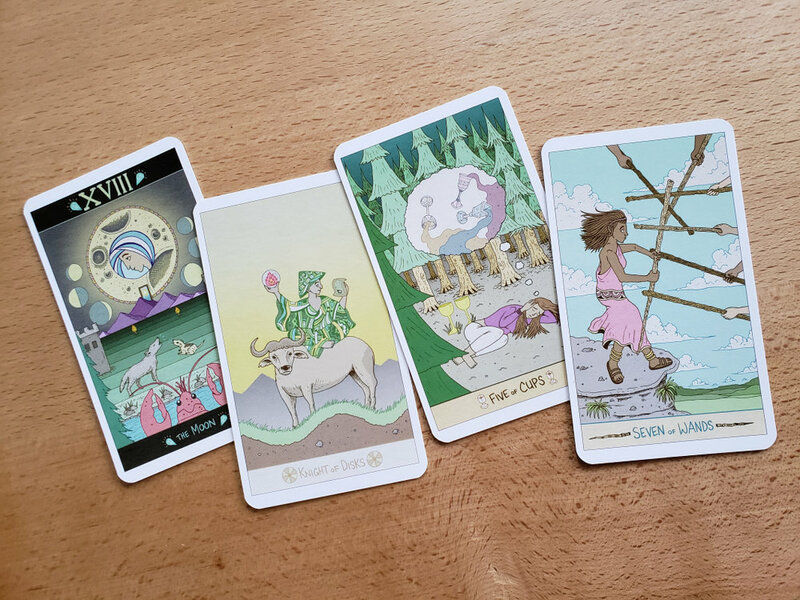 I was drawn to the Luna Sol Tarot by its sweet pastel color scheme, adorable art, and what looked like a real effort to have an inclusive deck. 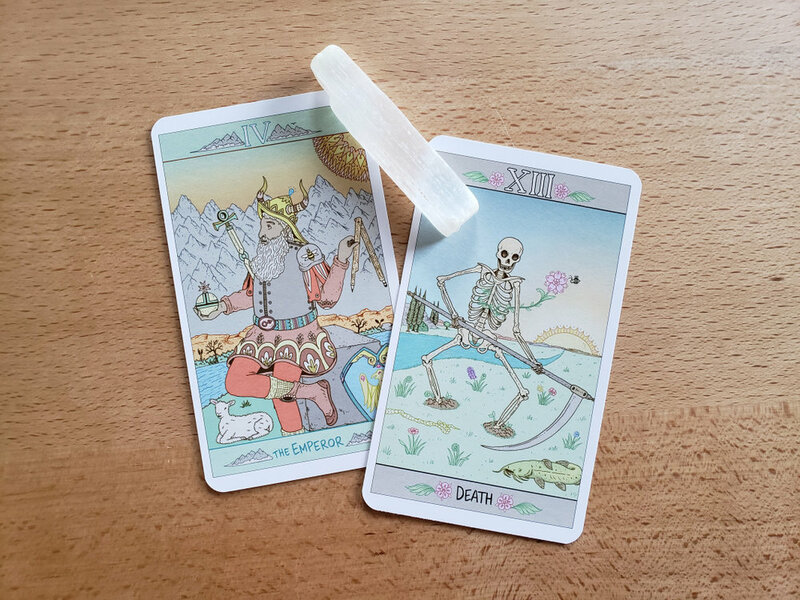 * It is intended to be both uplifting and modern, honoring the mainstay symbolism and also updating it with some currency with its softness, diversity, and easy to understand approach to tarot cards. The Luna Sol Tarot was boxed in a rather flimsy tuck box that was folded and a bit crushed in transit. Thankfully no cards were damaged and I suspect this is because of the amazing tarot bag it came with, black velvet and lined with cotton on the inside. It’s lush and protective and it was an easy thing to toss the box and decant the cards into the bag. The cards are standard sized and I didn’t have any problem shuffling or handling them. Card Stock is also on the good side of standard, semi-matte, and they seem like they’ll hold up okay over time. The deck has its own LWB The star of the deck is its art. Despite the pastel tones, it feels vibrant and the colors match the simple approach to the drawings. Simple of course is not a meant to be a deprecating word- I very much love the tendency toward simplicity I’ve been seeing in many indie decks. The backs of the cards are not reversible but with how lovely they are, it is easily forgiven. I adore the Moon card here in particular, but really all the cards in this deck are so lovely. I can already tell that this is a deck that will be particularly useful to folks just starting out in the tarot. For the most part, a lot of the art resembles the tradition RWS pieces with some updates that make the Luna Sol stand apart. Other cards seem to change the landscape entirely, but not to confuse. Instead the new representations offer clarity of understanding with symbols easy to connect with and be inspired by. I especially enjoy feeling the energy of the Luna Sol’s radiant Aces for each suit. Of course, my favorite part of the deck is that it is one I’m happy to add to my Tarot of the QTPOC series. I definitely read some of the characters as queer (might be my bias, but oh well) and we have diversity in racial background as well. When the deck was first announced, one of the completed cards previewed was Strength featuring a Black woman sitting with a lion. This would be unremarkable if not for the fact that I’ve noticed a disturbing trend in indie decks that do some inclusion. In fact look at your indie decks right now, put aside all that don’t have racial diversity and pick through what you have. Find the Strength, Empress, Five and Nine of Pentacles (that entire pentacle suit, really) cards- how many decks did you notice had a Black or Brown woman featured in those cards. Now find the Star, Queen of Cups, or Temperance. What trend do you notice there? Who gets to be soft and reflective and who has to be strong and resilient? The Temperance card made me well up a bit, no lie. Thankfully, after being able to see all the cards in the deck I’m over the moon that the Luna Sol didn’t continue with this trend. Yes there is what looks to be a woman of color in Strength, but there are people of color in the wands, cups, and- (this actually made me tear up a bit which I hadn’t done since I first held the Prismatic Tarot and saw that the Queen of Swords was a dark skinned Black woman)- a poc in the Temperance and Star card. I can also easily read many of the characters in the deck as queer without having to squint and just tell myself it is so. The Ten of Cups is a poly family, y’all. This is what getting closer and closer to real representation should look like- not just relegating specific groups to specific spaces and calling it diversity. It might seem like I’m being always being picky and over-sensitive and you know what, I am. We should all be more sensitive to each other and the harm we may do even with the best of intentions. When harm is caused, we must own it and course correct. As the indie tarot boom continues and artists and creators respond to the great demand of representation, I want more decks like this, like the Next World Tarot, like the Numinous Tarot, and all the other decks bucking the trends of tokenism. I don’t mean to make any one particular tarot creator feel bad, I just want us to continue to evolve in our awareness. We’re doing better with representation- great. Let’s do even better about how we go about it. I definitely recommend this deck for folks at all levels of experience with the Tarot. Beginners will find it non-threatening and inviting and more experienced readers will have a ton of fun spotting the old symbols made new and the ones added according to the artist’s perspective. Also, this is one of the more affordable indie decks out there and we should definitely support it even more because of that. Indie artists deserve to do more than survive, y’all! As always, I have to feature my Birth cards: The Emperor and Death. I can’t describe the squee sound I made when I saw the soft lamb at the Emperor’s feet and the bee on their spaulder. You can purchase the Luna Sol Tarot at Liminal 11’s shop. While there you should definitely peruse other offerings from Liminal 11. I’m particularly drawn to the Women + Patterns + Plants coloring book. And keep a lookout because Liminal 11 will also be releasing the Modern Witch Tarot by Lisa Sterle next year. I’m so hype! *While this deck was sent to me for review, my review of it here is honest and truly reflective of my opinions. If you’d like to submit your own work for review, drop me a line!